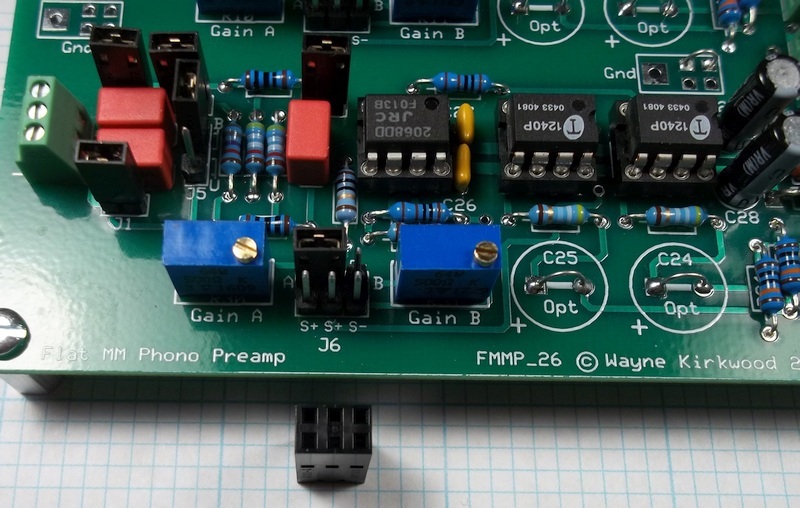 I have just received a new layout for the Flat Moving Magnet Preamp for the Phono Transfer System. The new board is identical electrically and mechanically to the original with the exception of the addition of a 6 pin Gain header. There is also a minor expansion of the ground plane "keep out" area under the dual op amps. The additional pins have connections for driven shields (thanks JR!) to minimize cable capacitance when external gain switching is used. The external gain can be either a DPDT switch to alternate between preset A and B gains, or it can be configured to switch Rgain for stepped gain control. Molex "CGrid-III" housings mate with the header to allow external connections or on-board jumper shunts. I'll post an image of the gain cables once I receive my ultra-miniature Mogami console cable. I also did a Common Mode Rejection test. Rsource is 1 KΩ per leg matched within about 0.5Ω. 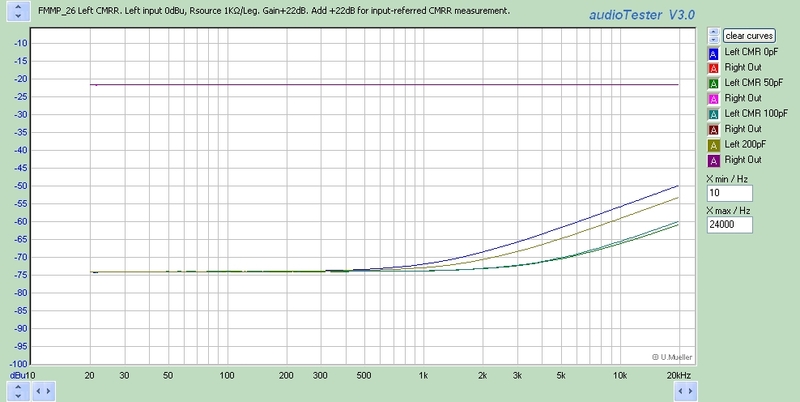 The gain is +22 dB so the measured CMRR numbers, referred to the input, are 22 dB better than shown. Sweeps are done with Cterm = 0, 50, 100 and 200 pF. (150 pF not shown). The top trace is the right channel output with the input differentially driven at -44 dBu and with 22 dB gain. The bottom traces are the left channel CMRR with the input driven at 0 dBu through 1KΩ resistors matched within 0.5Ω. The left channel differential gain is 22 dB. The CMRR at 60 Hz, referred to the input, is about 96 dB. There is, as expected, some effect of Ctermination on CMRR. The best combinations at HF are with J3 open where the CMRR at 20 kHz is still a respectable 70 dB. This BOM adds 2X 6 pin headers. The Centigrid housing and pins are for off-board gain switching. 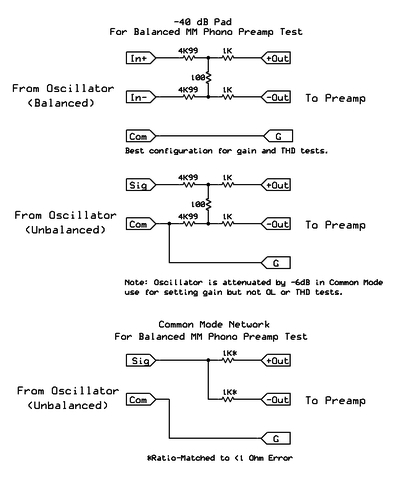 These are the pads and common mode networks I used to test the Flat Moving Magnet Preamp. The Differential test pad has 40 dB attenuation and can be driven from an unbalanced generator. For the Common Mode test network I matched the resistors to about 0.1Ω using a Kelvin-connected LCR bridge. With a regular DVM and clean leads matching to about an Ohm should be possible. 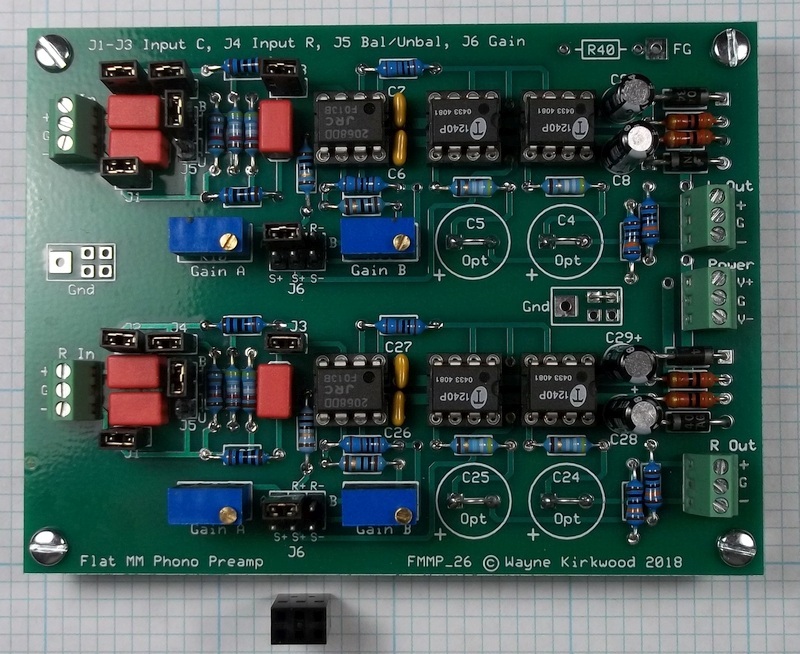 Pads and common mode networks used to test the Flat Moving Magnet Preamp. You can jump them to 0Ω if you'd like. R4 and R5, along with C3, provide some added RFI protection if needed. I'm not exactly sure why, but it is very consistent. 500Ω is on the high side. They do add some source resistance so the choice is up to you. It may provide all of us a clue. Please post some baby pictures when you finish building it and thanks for visiting us!